Today and for the next two weeks, we are going to talk about budgeting on MBA Mondays. Since the budgeting process works differently in companies of various sizes, we are going to focus on three company sizes; 10 people, 75 people, and 150 people. Today we will talk about the 10 person company scenario. As I said in a previous post, I have been working with Matt Blumberg and Jack Sinclair, CEO and COO/CFO of our portfolio company Return Path on these budgeting posts. I have been involved with Return Path for ten years now and I’ve watched Matt and Jack run excellent budgeting processes and so we are getting the benefit of their work and learning in these posts. Last week we talked about projections. It is important to run a projections process before you turn to budgeting. Think of budgeting as a refinement of the projections process where the goal is to predict what is going to happen in a particular calendar year. I believe that budgeting should be done on a yearly basis. If you want to start budgeting and you are in the middle of the year, that is fine. Just budget for the rest of the year and then do your first full year budget in the late fall. The late fall is budgeting time. October and November are the best months to do it. If you have a board, you should be able to present your budget for the next year to the full board in December so they can approve it before the year starts. If you don’t have a board, then you should be able to lock into a budget with your team in December. The budgeting process starts with a financial model. If you have done projections, then you should have a financial model already built. If haven’t done projections, then go back to the projections post, follow the directions, and do some projections. Then come back and read this post. The first step in budgeting is to review the key business metrics and lock them down based on what is realistic for the next year. Be very realistic. A good budget is a conservative budget. In a ten person company, the budgeting process can be done by a couple of the senior managers, typically the CEO and the most financially savvy of the other team members. These two people can run the process all by themselves without any input from the rest of the team. That will change quickly as the company grows, but in a very small company you do not need to involve the entire team in budgeting. If the company is pre-revenue as many 10 person companies are, then the focus will be on hiring and people costs. And the budgeting process will largely be about spending and how many people the company can hire and how much money the company can spend and how long its cash will last before needing another round of funding. If the company has revenues, they will not likely be large yet at 10 people, so the revenue forecast will be a bit tricky. In the first few years of revenue generation, the revenue model changes a lot and the drivers of it change too. I would encourage everyone to be conservative about revenue budgeting early in a company’s life. Most budgets are missed because revenue does not come in as planned. Make sure to include a cash line item in your budget. Most budgets are done as profit and loss statements which is how they should be done. But you should back into a cash projection based on the profit and loss numbers and include that line item in your budget. If this is new material to you, go back to my posts on profit and loss, balance sheet, and cash flow to see how these three statements work together. Once the budget has been locked down and approved by the board and/or by the senior team, you should share the budget with your entire company. Some executives don’t like to share the entire line by line budget with the team and I can understand that. 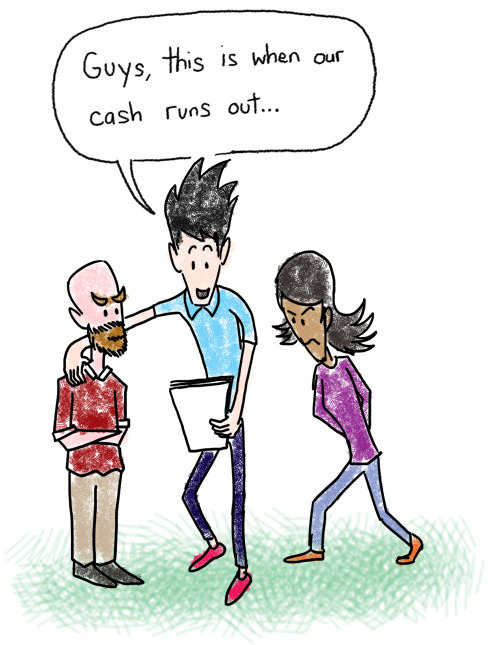 Some executives don’t like to show a cash line that runs out with the team and I also understand that. But you should at least show the key business metrics and some of the most important line items in the budget with the entire company. This will be their roadmap for the next year and it is important that they understand it if they are going to be expected to help you deliver it. All that said, I favor being as transparent as you can possibly be with your company. It is hard to hide information from the company. The important information leaks out eventually and if and when it does, you won’t be there to provide context. So the more information you provide, the better off you will be. Once you have a budget, you need to measure yourself against it. Each month report the actual numbers versus the budget and track how you are doing against each key business metric and line item in the budget. At some point during the year, you may want to do a reforecast. We will talk about that exercise in a few weeks. Next week we will talk about how this process changes as you grow to 75 people. It a very different process at that point. This is true, but it depends how you define that. If I’m conservative with my cash, that means I’m not spending it. But in a conservative budget, I think you need to be aware of the upper limit of the money you might spend. You may plan to conservatively spend $X on office equipment, but you may have underestimated the cost/prices are higher than expected, in which case you don’t have the money in your budget. To counter this, we have a line in our budget to factor in a 5-10% margin for unexpected cost. I’m not saying you have to plan for a worst case scenario all the time, but it helps to have a margin for error in mind. This article was originally written by Fred Wilson on May 10, 2010 here.